Found a couple more paintings featuring hands. Here's one of my husband's brother, George. 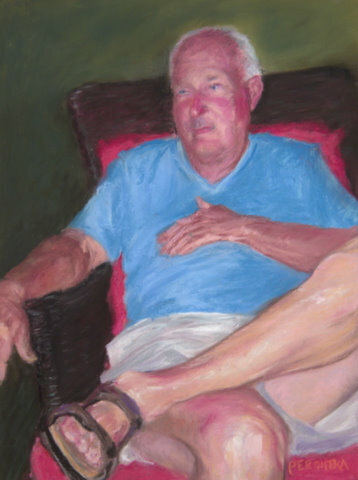 Although the perspective is off on the hand resting on his belly and I'm not sure how I feel about the "vertically amputated" hand resting on the chair, I do like what I did with the foot, ankle, shin and knee in the foreground. The second painting features my husband's hand holding a sprig of lavender. It took hours to get the lines and calluses the way I wanted them and I'm happy with the result. I like this painting quite a bit but need a better photo.